ANNISTON, Ala. (April 17, 2014) The upgraded MX-10 Mixer/Pump from Blastcrete Equipment Company has the fastest, most efficient mixing capabilities in the industry. Its new, closed-loop hydraulic circuit delivers greater speed and torque to quickly and effectively mix dense refractory materials in less than two minutes. The new system provides greater efficiency that leads to faster and greater ROI on demanding refractory wet shotcrete and pump cast applications in foundries, power generation, petrochemical, steel mills and cement manufacturing facilities. The MX-10’s hopper handles up to 2,500 pounds of material, and its high-speed hydraulic agitator keeps materials blended and in suspension as the material flows to the pump. The unit’s 3-inch swing tube piston pump operates with up to 2,200 psi for consistent installation of as much as 12 tons of material per hour. The high-pressure pump also allows customers to achieve up to 450 vertical pumping distances when installing refractory materials. The MX-10’s 22-square-foot platform provides 50 percent more space than competitive equipment to give operators ample room to maneuver easily. The electrical controls are mounted on the platform and positioned away from the mixer to remain free from debris and water. The unit is mounted on dual 7,000-pound capacity axles with electric braking and lights for enhanced safety when traveling. Lifting eyes on the platform allow operators to use a crane to lift the machine and place it on a flatbed for traveling longer distances. It also allows users to place the unit on work platforms in larger factories. Blastcrete offers the MX-10 with an optional skid-mounted framework that reduces the overall length, width and height of the machine. The new MX-10 can be equipped with a John Deere 4045T 99-horsepower or Deutz BF4M 2012 102-horsepower water-cooled diesel engine. Blastcrete also offers the unit with electric motors. The engine on the MX-10 is placed away from the mixer and receiving hopper to prevent thermal transfer that causes refractory materials to set prematurely. The MX-10 is faster and easier to clean than traditional swing-tube piston pump units. The swing-out receiving hopper provides easy access to the lower hopper and swing tube section for cleaning and maintenance. 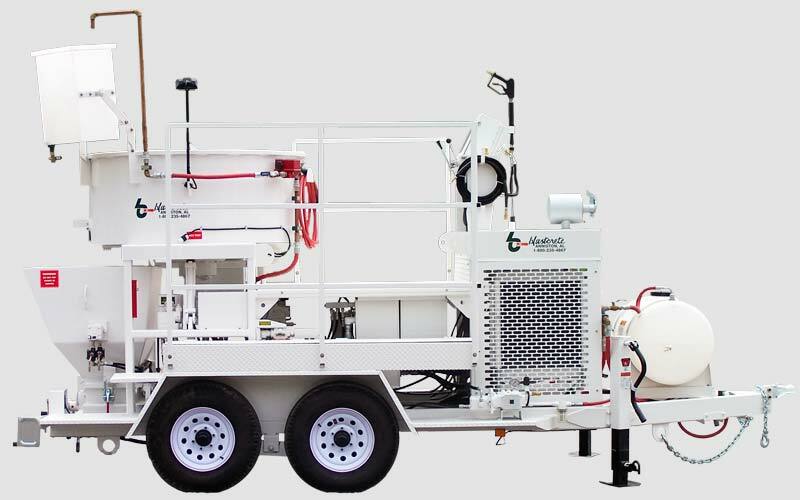 Blastcrete offers an optional 2,000-psi hydraulic pressure washer for easier cleanup and an automatic lubrication system to ensure proper greasing of the swing tube pump. The MX-10 is CE-certified to meet European Union safety standards for equipment operation. Filling ICFs – When is a Concrete Pump Attachment Ideal? Are You Ready For OSHA’s New Silica Guidelines?